We often neglect to take a moment to connect with the world that encompasses us in its beauty every day. I find we are losing the awe we once felt watching birds soar through the sky, seeing flowers bloom in bright colors in the spring, and listening to the pitter patter of rain on our bedroom windows when we were children. As a young girl, I always found myself able to connect with horses, something many do not have the opportunity to experience. During my search for a high school, I looked high and low for something, anything, about a school that would enable me to strengthen my understanding of myself, as well as about the beauty and secrets hidden in nature. Upon arriving at George School, I was immediately captivated by the beautiful horses and extensive Equestrian Program. I finally knew where I belonged and was determined to be a part of the family housed at the barn. Now almost halfway through my senior year, I can confidently say the barn has been a place of solitude and comfort for me through the stressful weeks of exams, as well as the joyful moments, like receiving my acceptance letter to Bucknell. I had never been part of a team as close-knit and family oriented as the equestrian team here at George School. 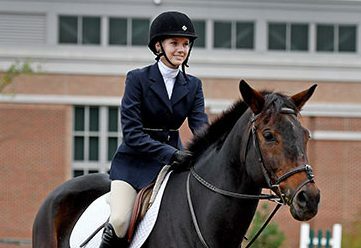 Tiffany Taylor, our director of the Equestrian Center, has become a second mother to me, ready to offer guidance through unfamiliar situations or a simple hug when needed. She has taught me more than I ever thought I would learn through riding. The horses are another source of wisdom that have remained a constant through all the changes I have gone through in my time here. At the end of the day, going down to the barn offers an immediate sense of relief when I see the horses munching on hay or whinnying at each other. High school is stressful, but the barn is a place where that all vanishes. When I am riding, all I need to focus on is my connection with the horse. I have no choice but to be present and ready for anything these animals may throw my way. Centering myself, literally on the horse and figuratively in my mind, is something so important to my well-being. This time spent riding and caring for the horses at the end of the day is my time to build a connection and understand a creature so different, yet so similar to me. These horses have a mind of their own, and they are not afraid to let you know when you need to relax your arms while you are riding or create a stronger connection between your leg and your reigns. They are exquisite creatures with so much to teach us. Not only am I fortunate to spend time with these animals every day, but I could not be happier to say I am part of the equestrian team. The key word here is team. When people think of riding, they often think it is just you and the horse. How could there be a team? I am here to say loud and proud that they are right. We are not just a team, we are a family. Through these years, I have fostered friendships with my fellow equestrians unlike any relationships I have had before. My family at the barn is the biggest support group I have, constantly letting me know when I have done well, but also when I may need to work on myself riding and socially. There is no possible way for me to express my gratitude to this family through words, but I want them all to know that I love them. I hope to experience a family like this at Bucknell, and look forward to bringing the wisdom and love I have gained here at George School to Lewisburg, PA. Whether you find peace with horses or simply taking a walk, remember to dedicate some time each day to center yourself and connect with your surroundings.